Air travel is a staple of modern life, as evidenced by the record number of passengers that Transportation Security Administration (TSA) officers screened in 2018: 813.8 million! That’s an incredible number that shakes out to over 2 million screenings per day. As you can imagine, with more people taking to the air, the more likely it is that a passenger with either forget about (or worse, deliberately try to sneak through) that firearm in their carry-on bag. In addition to the record numbers of travelers in 2018, TSA officers found a whopping 4,239 guns in carry-on bags (that’s more than 11 per day), amounting to a more than 7% increase over 2017. And those numbers don’t include all of the other wacky and dangerous items (like knives hidden in shampoo bottles) that TSA officers are forced to contend with. 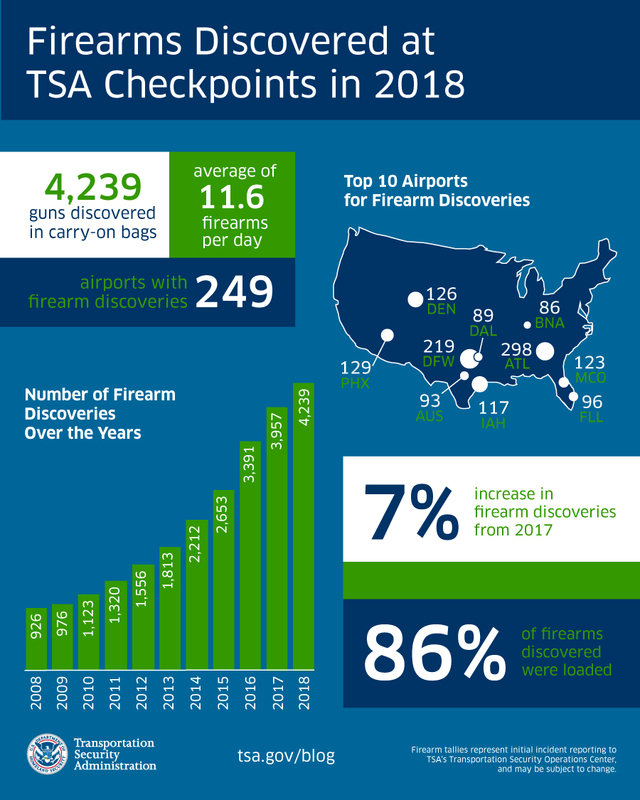 This infographic from the TSA breaks down some of the data, including which airports saw the highest numbers of travelers attempting to get weapons on board their flight.